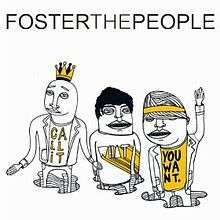 (2011) "Call It What You Want"
(2011) "Don't Stop (Color on the Walls)"
"Call It What You Want" is a song by American indie pop band Foster the People. It was released as the group's third single in December 2011 from their debut album Torches. The song was written by frontman Mark Foster and produced by Paul Epworth. The song was also featured in the soundtrack of the video game FIFA 12. The song appeared at number 14 on the Triple J Hottest 100, 2011 poll. A music video to accompany the release of "Call It What You Want" was first released onto YouTube on November 1, 2011 at a total length of four minutes and two seconds. The music video begins with the phrase "Idle minds are the devil's workshop". The video consists of random, strange sections, including singer Mark Foster pretending to shoot adoring fans with his right finger, drummer Mark Pontius floating while playing the drums, and the band running around outside while fireworks go off around them. The music video was shot in Villa de Leon in Malibu, California. 1 2 "Top 50 Singles Chart - Australian Record Industry Association". Australian Record Industry Association. Archived from the original on February 6, 2012. Retrieved 5 February 2012. Archived by WebCite from the original Archived May 18, 2011, at the Wayback Machine. on 5 February 2012. ↑ "Ultratop.be – Foster The People – Call It What You Want" (in Dutch). Ultratip. ↑ "Ultratop.be – Foster The People – Call It What You Want" (in French). Ultratip. ↑ Zywietz, Tobias. "Chart Log UK – Update 10.12.2011". Zobbel. Retrieved 2011-12-11. ↑ "VÖ-Vorschau". beatblogger.de. 8 April 2012. Retrieved 8 April 2012.